Day By Day includes reading of the eponymous prayer followed by beautiful piano music based on original composition of Frederic Chopin. Piano composition includes: Nocturne in F Minor, Op. 55 No. 1 — Andante. Chopin’s bittersweet nocturnal piece with dramatic and anxious progression culminating in an exciting stretto. Chopin dedicated this nocturne to Jane Stirling, a devoted pupil. Performed by Anton Kingsbury. 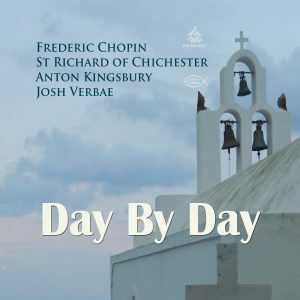 Frederic Chopin was a French composer of Polish descent and virtuoso pianist of the Romantic era, who wrote primarily for the solo piano. He gained and has maintained renown worldwide as one of the leading musicians of his era, whose poetic genius was based on a professional technique that was without equal in his generation. Chopin was born in what was then the Duchy of Warsaw, and grew up in Warsaw, which after 1815 became part of Congress Poland. A child prodigy, he completed his musical education and composed many of his works in Warsaw before leaving Poland at the age of 20, less than a month before the outbreak of the November 1830 Uprising.